This post probably won’t have anything to do with rhetoric, teaching or music, unless I find some torturous route to relevance, but it is what I am thinking about this morning. 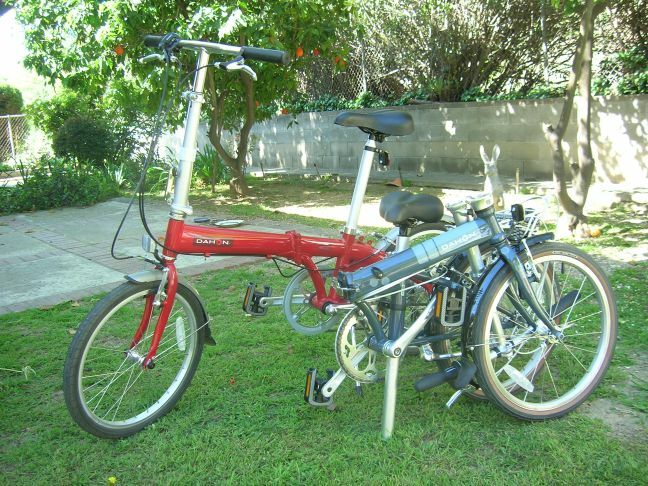 Due to the need for an enhanced exercise regimen, and some changes in my personal life, I recently acquired a couple of folding bicycles (see pictures near the end of this post). I used to ride quite a bit when I was younger. I had an old Schwinn ten-speed that I rode to high school. I had that painted and fixed up and I rode it later when I was teaching at Cal State L.A. Then I got serious about biking for a while and I got a 12-speed Nishiki that I used for transportation. After a while I decided that the frame on the Nishiki was a little big for me, and I traded it to my brother for his Peugeot. However, the Peugeot sat unused for quite a while, and I finally got rid of it. I hadn’t had a bike for years when I got the folders. Using bikes for transportation in the L.A. area is nerve-wracking. Even if you plan your route well, you are going to deal with traffic and parked cars. You have to be ever vigilant against the motorist who is going to open the driver-side door of a parked car right in front of you. If this happens just as a supermarket truck is passing you, as happened to me, you are in deep trouble. The truck missed me by an inch or so. I stopped riding in traffic. Once I took the Nishiki on a bicycle wine tasting tour with a friend from high school. We started from Santa Rosa, north on Old Redwood Highway, which had been the main road before U.S. Route 101 went in. There was almost no traffic on the road, so the ride was peaceful, yet exhilarating, at least at first. I forget the first winery we stopped at, but it had a beautiful approach, a long driveway lined with trees. We were the only tasters there, and we were greeted by a young woman of blond, ethereal beauty. Smitten, I bought two bottles of Gewurztraminer, forgetting for the moment that we were on bicycles. I had panniers (saddle bags) on the rear rack of the bike, so a bottle went on either side. Now I had to carry the wine all the way to Healdsburg and back, about 30 miles round trip. It was idiotic. My friend wanted to see a former girlfriend in Healdsburg, so that was our destination. He had done theater work at Santa Rosa Junior College, so later that evening we were to see a production of Dracula. All in all a full day. When we got to Healdsburg, it turned out that the girlfriend was off on a camping trip with another guy. This disturbed my friend more than I had anticipated, and he simply jumped on his bike and began pedaling furiously on the way back to Santa Rosa. I followed, but although Old Redwood Highway was free of traffic, it was full of potholes and thorns. My 100 lb. pressure clincher tires were easy to roll, but they weren’t very thorn proof and I soon had a flat. I stopped to change the tire, but my friend, absorbed in his emotions, pedaled off out of sight. By the time he returned, I had changed the tire, but about half way back, I had another flat. This time I didn’t have a spare tube or any more patches, so it was time to walk the bike. We made it to the play, which was horrible, and the next morning we made repairs. Biking is great fun if you learn from your mistakes. Don’t buy wine at the beginning of the trip. Call ahead to see if your girlfriend still loves you. And if there are likely to be thorns, use tougher tires. I think these days you can get bike tires that contain Kevlar. Nothing could be done about the laughable production of Dracula. So why folding bikes? 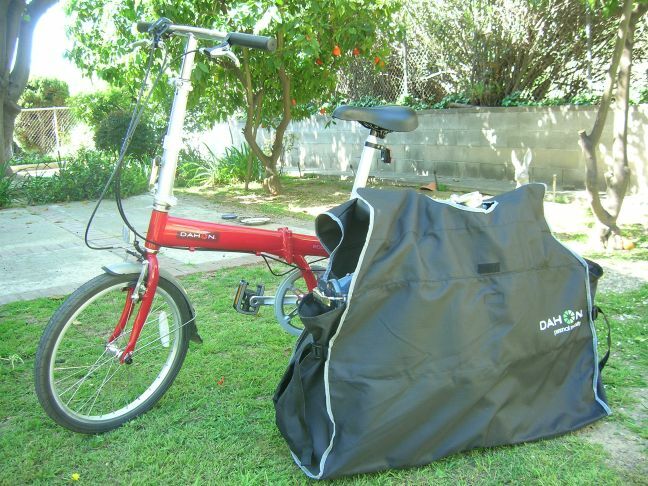 A folding bike can fit into the trunk of a Honda Civic, or the back seat, without disassembly. You can drive to the lovely bike path and enjoy biking without sharing the road with trucks. You can put the bike in a bag and take it on the bus. You can store the bike in a closet, or under the stairs. There are many advantages. 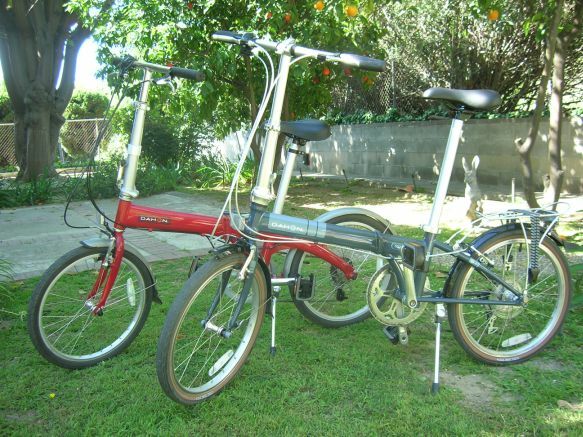 Folding bikes generally have small wheels, either 16 or 20 inches, tall seat posts and tall handlebar posts. Everything is instantly adjustable. Once you figure it out and practice a bit, you can fold or unfold the bike in about 15 seconds. The high end models are very light. Those under $400 or so are generally heavier, but still under 30 lbs. When I started investigating such bikes, among the cheapest were bikes like the Citizen Tokyo for $164. People seem to like those bikes, but they also seem to want to upgrade them. Bromptons are popular, but are custom-made and most cost more than $1,000. Bike Friday makes some models that fit into an airline suitcase that can be converted into a bike trailer. Downtube is another popular bike, with a lower price. The bag is fairly easy to carry on your shoulder. It is large, and a little heavy, but it looks like a large duffel bad. Most people would not see it as a bicycle. We have taken these bikes riding at Venice Beach and at Griffith Park. They are great fun. The Venice bike path has signs painted on the path every 50 yards or so that say “Bikes Only.” Of course there are roller bladers, joggers, pedestrians, baby strollers, dog walkers, and spaced out cellphone talkers as well, along with serious cyclists on high-performance racing bikes whizzing by. It’s a zoo. I didn’t see any other folding bikes, but we fit right in. One day we went from Venice almost to Malibu. The folders are odd-looking bikes, but that is part of the fun. We are still finding new ways to use them. Being out on a bike does tend to get you out of your daily routines. Yesterday in Griffith Park we met a woman who was handing out flyers for her garden club show, so we stopped and bought a geranium. I’d actually never been to a garden show before. This entry was posted in Bicycles and tagged Dahon. Bookmark the permalink. I had always seen folding bikes used by RVers; I guess they are useful for anyone who needs to put them in a car or carry them. I was in Marina del Rey today–lots and lots of people on bicycles, and it was a beautiful day for it. It looked to me like the bike path went over the canal, so you could actually continue biking from Malibu past Venice and Marina del Rey to the Southbay, ending in Torrance–is that the case? And perhaps Santa Monica is the north end of the strand/path? I am still investigating how far the bike path goes. Shortly after Venice it goes out on city streets for a while, which is not nearly as relaxing. I think eventually it becomes a dedicated beach front bike path, but I am not sure where. Today we went south from Venice as far as Fisherman’s Village in Marina Del Rey. The bike path does go onto city streets for several blocks, but turns back toward the beach and is a dedicated bike path, with occasional street crossings, for a couple of miles. The bike rental guy at Fisherman’s Village said that you can bike south all the way to Manhattan Beach. We will try that soon. Very cool, John. The bikes look good, and I love the geranium bit. Incidentally, the trees in front of the CLA building at Cal Poly are at that wonderful stage when the leaves are coming out, so the branches are green, but still have their wintry skeletal look. In case you haven’t noticed. And a note about the previous entry–English departments may only have a hundred year history, but the study of literature and language (even rhetoric) is considerably older. Why doesn’t that count? Terry Eagleton argues in Literary Theory that the purpose of teaching British Lit is to civilize the middle class with upper class values. The middle class was unlikely to learn Greek and Latin to read the classics, you see, so give them Jane Austen. He also argues that teaching national literatures is closely associated with nationalism. Grammar and rhetoric have been taught for more than 2,000 years, but again, it is mostly about upward mobility through class structures, and political success (I must be in a Marxist mood this morning). Americans do not relate their national character to works of literature anymore. The American mythology is more about Star Wars than Huckleberry Finn. However, folding bicycles are cool, and the geranium is thriving. Ah, I sense wistfulness regarding the changing times, finally. Up until now, you have been so accommodating of current trends that I thought you were completely at ease with it all. Jim, that is an interesting observation. I think that we have to live in the times we are in, learn from the past, and look toward the future. I teach classical rhetoric not because I think that the Greeks and Romans lived better than we do, but because what they developed is still useful today. I teach science fiction because thought experiments about the future consequences of our actions help us think about the decisions we make in the present. Helping students understand the past and look at possible futures helps them understand the unfolding culture they were born to, swim in and take for granted. Every culture in history has complained that the youth are no good, and that things were better in the old days. I think the kids are alright, and always have been. However, society now changes at such a fast pace that the gap between instructor and student feels like two or three generations instead of one. Exploring that gap enlightens us all. But yes, sometimes the past seems simpler, and more comfortable. If this were a discussion board, somebody would be complaining that these posts are OT and have nothing to do with folding bicycles, and the moderator would intervene. Wait a minute, I am the moderator!